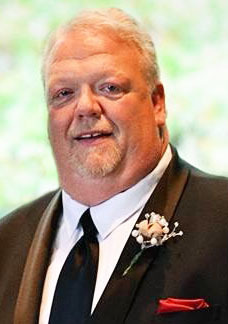 James “Jim” Edward Bennett, 60, husband of Martha Littlefield Bennett, passed away Friday, February 8, 2019. Born in Greenville, he was a son of Della Whitmire Moody, and the step-son of the late J. Clifford Moody. Mr. Bennett was the owner of Bennett Tire & Automotive. He was a member of Greer Lions Club, and a member of Journey Fellowship Church. In addition to his wife and mother, he is survived by a daughter, Chelsea Duncan of Greer; two sisters, Lynn Bennett Dennis of Auburn, WA, and Elizabeth Ashley Bennett Dayley of Caldwell, ID; a brother, Ralph Austin Bennett III of Pacific Washington; and a soon to be born grandson. He was predeceased by his grandparents, Ed and Shirley Whitmire. A memorial service will be held Tuesday, February 12, 2019 at 6:00 PM at Thomas McAfee Funeral Home, Southeast, with visitation following. Memorials may be made to Greer Soup Kitchen, 521 E. Poinsett St., Greer, SC 29651, and/or Greenville County Humane Society, 305 Airport Rd., Greenville, SC 29607.